Experience in the nearby dairy farm looking after cows and calves, lambs are born again in early March what you do not want to miss! Come and enjoy! 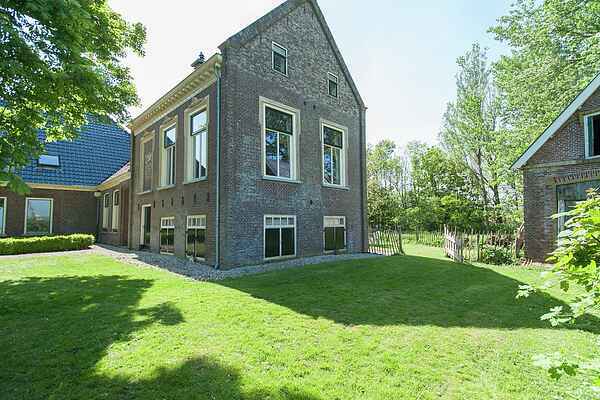 The front house has a private entrance; on the first floor is a spacious living room, a toilet and a fully equipped keuken.Op the second floor is a large bedroom (18 m2) with a double bed; a small bedroom (8 m2 and slanted wall) with 2 single beds and a bathroom with shower, sink and toilet. In the spacious upstairs room (36 m2), the bedstedenwand to the imagination. Where in the past loopholes dove into the bedstead can prepare a meal in the kitchen. The fireplace has been restored with typical Frisian tiles. The room is just above the milking barn and you have a beautiful view on the fields and in the distance the village Easterlittens. There is an enclosed garden with outdoor furniture but you can also find somewhere else a nice place to sit down. Het hamlet Skrins includes four farms, two of which are in operation. It is located in the Frisian plains, "the Greidhoeke". The village lies at the junction of Easterlittens the Bolswarder and Franeker Vaart. The distance (15 km)to Bolsward, Leeuwarden and Sneek. These cities offer a wide range of cultural and culinary adventures. For nature lovers, it is nice to know that there are many types of birds in this area.